It's a new month and a new topic in our blog circle's 52 week playing with light adventure. This month was are playing with directional light and I cannot wait. I think I am going to love directional light, as long as the sun comes out! Directional light may include: side light, back light, rim light, light from above or below. I did not have as strong of above and side lighting as I had hoped for today, but I worked with what I had. The last image actually shows the directional light best. I worked with macro photography and one of my favorite perennial plants. It is an heirloom peony that a friend from book club gave me when we first moved into our home almost 15 years ago. 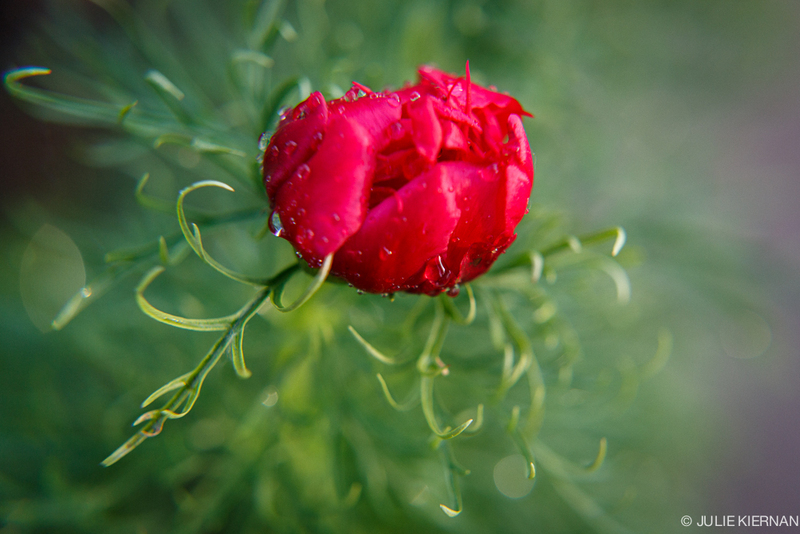 It is a small, delicate plant with miniature red peonies. For years, I didn't know what the plant was. Someone told me that it's an heirloom peony, but I have never been quite sure. What I do know for sure, is that I love this little plant and it is one of the first to bloom each year in my garden; right after the tulips and before the irises. If anyone is a gardener and recognizes this beauty, please let me know. The first three images are the heirloom peony, the fourth is a bud from my regular peonies (from my mother-in-law and sisters's gardens) followed by the leaves of another plant. I am trying something new with a slideshow for the five images. When you are done, please follow along the circle to my friend and fellow photographer, Linda Hooper's interpretation by clicking HERE. Linda is a master of macros, abstract and OOF (out of focus) images, so I thought of her as I captured these. Congratulations to Linda on her recent acceptance as a CMPro, the forum we all met and take many of our classes with.